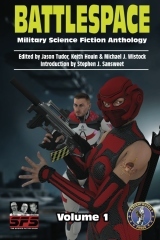 Battlespace, Volume 1, featuring 28 military-related science fiction stories, including my short story, A Flash of Insight (the first story in the volume), is available now on Amazon as a Kindle download and as a print edition available at Createspace. The volume is edited by Jason Tutor, Keith Houin and Michael J. Wistock, presented by The Science Fiction Show. 100% of all proceeds from sales of this book (except those paid to cover costs for eBook retailers and printing) benefit the Warrior Cry Music Project in Washington, D.C.–a great cause worthy of support. The book is 226 pages long. You can find out more about it on Amazon and from the folks at The Science Fiction Show. This entry was posted in Battlespace, Charity, News, Science Fiction, Veterans. Bookmark the permalink. This looks very interesting. I love military sci-fi but have not written much myself. I took a look at your bio – which was very impressive.